This was very much a home-grown production from Alvechurch Dramatic Society, and congratulations to writers Chris Davies and Paul Chamberlain for a witty and highly topical script. It was a genius stroke to name the smarmy nasty banker and central character “Bent Barclay” (played by Chris himself), as it was to refer to his henchman as “Cammo” and “Ozbo”. The storyline featured a youthful desire by orphan Belle Bottoms to run off and join a circus, aided and abetted by her orphan chums and a ghostly clown. Inspired by a music box, she makes a break for it, ultimately realising her dream to be a circus performer – but with a relationship twist at the end. All the ingredients of pantoland were in evidence in a show which was a little lengthy, though oozing with overt characters and incorporating the inevitable comedic, political and innuendo-based one-liners (but very clever for all that). From the outset the cast of brilliantly-conceived characters emerged, each with their own idiosyncrasies. It is not possible to mention all individually, though some do deserve a mention for their ability to deliver the clever script and for a sheer crazy desire to entertain, such as “Belle”, played by Gemma Batty, and “Mr and Mrs Grimwhip” (Alan Clarke and Susan Resuggan). 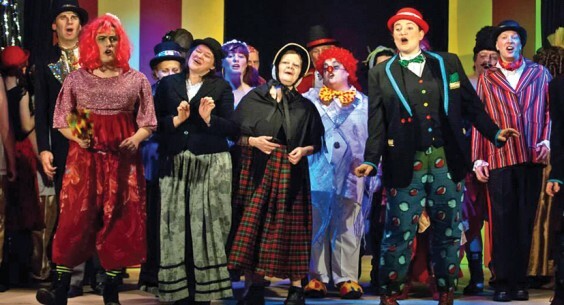 “Elvira the bearded lady” was played by Fiona Holmes with a superb accent, Kelly Harrington was larger than life as “Clown Spirit”, Jo Bestwick was vocally strong as “Scarlet Rose”, while “Gordon the Gorilla” (Tony Godfrey) was a magnificently costumed character. Sarah Batstone as “Jobsworth” played her part to perfection as the officious inspector from “Ofcirc”, popping up through the show to rattle off volumes of paragraphs and sub-clauses. As “Cammo” and “Ozbo”, Naomi and Leah Yendell were excellent, as was “Mrs Sludge” (Pauline Chadaway) in a memorable couple of scenes reminiscent of Mrs Overall from Acorn Antiques. There was strong support from Adrian Perry as “Vacant Plot” (wonderful name for a mind reader) and Chris Tomlin as “The Great Bazooka”, fired from an on-stage cannon in a clever scene. Scenery and a number of efficient scene changes brought us The Orphanage Kitchen, a spooky graveyard, Bent Barclay’s mansion, and of course the inside and outside of the Big Top. A multiplicity of vibrant costumes, enhanced by effective lighting, sound and other effects, just added to audience appeal. The legendary panto bag containing certain props (oh yes they did) for audience participation were a nice touch. A three-piece combo provided pleasing musical accompaniment ending with a rousing Enjoy Yourself (It’s Later Than You Think). We did and it was, but great entertainment for all. Thank you Alvechurch for inviting us.